I’ve created a new floral set for you and rest assured, it was made with all my love. I hope you’ll enjoy your new resources. We love flowers, no matter if it’s spring, summer, autumn or winter. These elements can be used any time of the year! 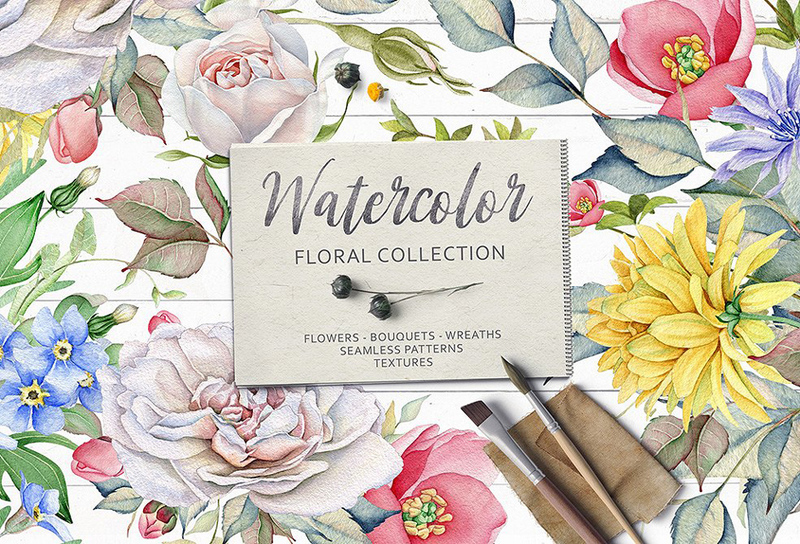 Watercolor Floral Collection: Flowers, floral arrangement, wreaths, DIY, textures, backgrounds. 167 .PNG and 37 .JPG files. File size is approx 3.44GB (3.47GB unzipped), offered as a four part download. My internet is being a pain and I’m dying because I really would love to download this and several other previous purchases. It’s obviously nothing Design Cuts can do but I thought I would make a helpful suggestion. I would love if there was a small file to download that gave me a breakdown of what was in each separate download of a product. For this one, there are four downloads and each are almost or over a gig…which my internet is painfully dragging it’s sorry behind on. A small catalog sheet of each section would make it much easier if I was going to only use a part of the product at first. Oh dear, I’m really sorry to hear that you are experiencing slow downloads Rebecca! Rest assured we are always happy to provide you with Dropbox links to any of your resources to help speed up the process for you, so please let us know if you would like any help with your downloads! We really appreciate your suggestions and I can certainly pass this on to our team for you to see if this is possibly something that we can include in future for you :). Just finished downloading this collection and looking through it. I love the visual texture of this watercolor collection! Can hardly wait to start using it. Yay we’re so glad to hear that you love it Deborah and hope that you have lots of fun working with these! I’m having some trouble purchasing this collection. I can’t seem to use my Paypal account, because it keeps asking me to add a creditcard. (which i don’t have). Is creditcard the only way to purchase this? If so, is there any other way for me to purchase this, because i REALLY want/need this collection for an upcoming project. Hope help can be provided. Part 3 of this collection does not download properly. I’ve downloaded twice and the file is empty when unzipped. I am so sorry that you are having trouble downloading!